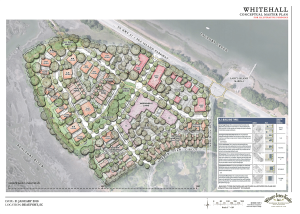 Next Monday, Feb. 19, the Metropolitan Planning Commission (MPC) will meet to consider the latest application for development of the Whitehall property. A first proposal was denied 6-0 in November, and a new plan was filed by lead developer Sam Levin Feb. 1. The meeting will be held at Beaufort City Hall at 5:30 p.m. The now-lead developer, Sam Levin, grew up in Beaufort and graduated from Beaufort Academy. He is a graduate of College of Charleston, and until his recent return to Beaufort, was involved in residential development and commercial real estate in Charleston and Mt. Pleasant. He is currently developing a number of assisted and independent living facilities in the Southeast. The Retreat, an assisted living facility now under construction on Lady’s Island near Hamilton Village, is one of his projects. What’s the new Whitehall plan look like? Last Autumn, a group led by MidCity Real Estate Partners in Atlanta proposed development, via a special zoning “overlay,” of the 19+ acre Whitehall property across the river from downtown Beaufort. The purpose of this special zoning was to get around zoning requirements set out in the new Beaufort Code, approved in June 2017. The requested overlay would have permitted significantly larger buildings on the site, and the plan then submitted called for some 240 residences in seven apartment towers, a 100-unit Independent Living (vs. Assisted Living) facility, and nearly 20,000 sq. ft. of retail commercial space. 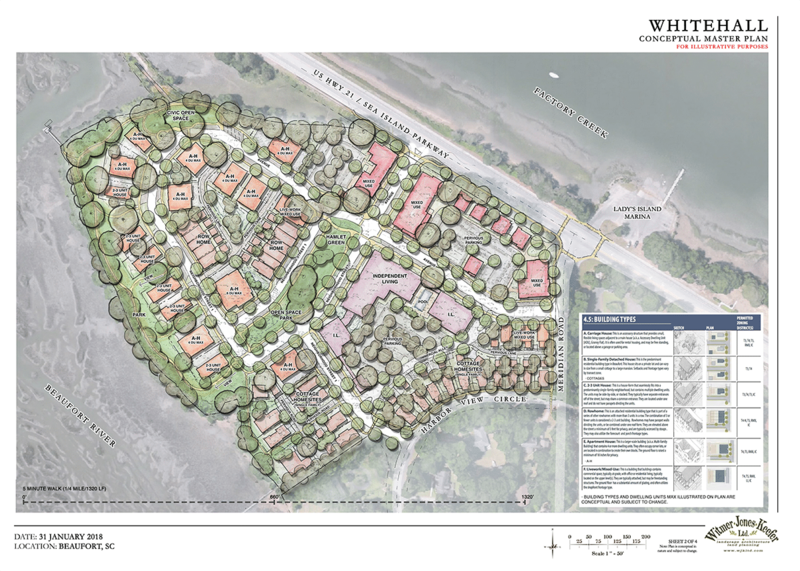 On February 1, developers filed a new “By-Right” plan for Whitehall, one designed specifically around the requirements of The Beaufort Code and the Civic Master Plan, and quoting the code verbatim in its application. The developer seems to have heard the community. The new plan, among other things, eliminates the seven large-scale apartment buildings, appears to largely limit building height so as not to interfere with the tree canopy, and increases the buffer between the river and planned construction. Residential development is now planned for “80-100+/-” units (versus the 240 originally proposed) comprised of a mix of small-scale apartment buildings, multi-family facilities (the Independent Living facility), mixed-use buildings, row homes, and single-family housing. The 100-unit independent living facility and retail/commercial neighborhood remain largely intact. The retail/commercial “neighborhood” along the Sea Island Parkway remains. The conceptual master plan shows three larger structures (likely full-service restaurants) and five smaller-scale buildings along the parkway designed for individual retail or service businesses. 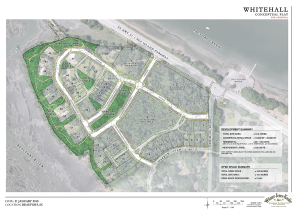 Click here to see the entire Whitehall development application with the City of Beaufort. What does “By Right” mean? “By Right” development refers to development projects that are permitted and conform to current zoning for the property being developed. Typically, “by right” development is subject only to administrative review with little or no public input. However, because Whitehall is a major subdivision and within the growth boundaries of Beaufort, site plans are subject to MPC review. The final master plan, including building designs and the like, will have to be approved by the City’s Design Review Board (DRB). 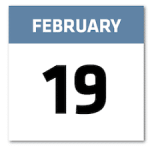 What, exactly, is the MPC voting on Feb 19? On Feb. 19, the MPC will be asked to consider a “conceptual plat” reflecting the developer’s plan. (A plat is a plan or map of an area of land, especially a proposed site for construction). The conceptual plat lays out, in general terms, planned streets and neighborhoods, building lots, open space, etc. The MPC, after reviewing the conceptual plat, may 1) Deny the application, 2) Approve the application with conditions, or 3) Approve the application as submitted. If the MPC votes to deny, the developer can then appeal the decision to the circuit court. What does current zoning for Whitehall permit? The City of Beaufort’s T4-Neighborhood district zoning applies to Whitehall. In The Beaufort Code, T4N is described as a “mixed-use zone of urban residential units and limited commercial development. A wide range of building types exist in the T4-Neighborhood district, including, but not limited to, apartment buildings, mixed-use buildings, rowhomes, duplexes, corner stores, and both attached and detached single-family housing.” (For more details regarding zoning, permitted uses and building design standards in T4N, see The Beaufort Code, pp. 12-16; 50-53 and Article 4). What happens after Feb. 19? The preliminary plat is first subject to review by the City’s Technical Review Committee, and if approved there, it is then referred to the MPC for approval. At this juncture, and assuming MPC approval, final approvals related to buildings and design etc. will be referred to the City’s Design Review Board as appropriate. Like MPC meetings, Design Review Board meetings are posted in advance and open to the public. Where do the City and County stand on development at Whitehall? This is a City of Beaufort project, as Whitehall was annexed into the City of Beaufort in 2005. Both the City of Beaufort and Beaufort County are represented on the Metropolitan Planning Council. Perhaps as a result of this, no elected official in the City or the County has publicly expressed a view on Whitehall development or development plans. Whitehall development clearly represents a significant tax windfall for Beaufort, a fact the City Council clearly appreciates, however official silent it has been. 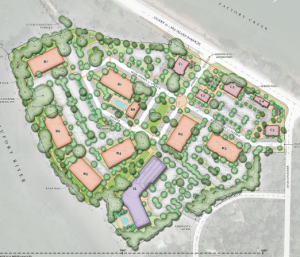 And after approval by the MPC, all decisions regarding the development of the property will be “administrative,” that is, made by the City of Beaufort. City annexations of large portions of Lady’s Island, done without any political accountability, have already created tensions between the City, residents of Lady’s Island and Beaufort County. 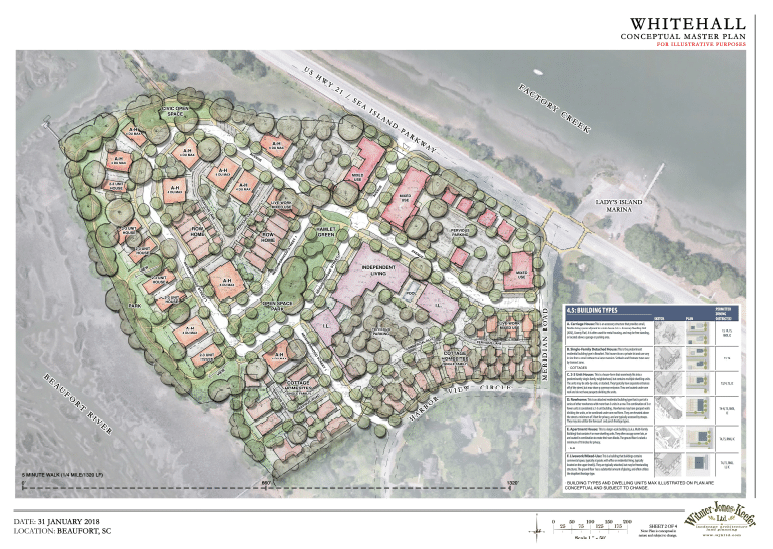 In making future administrative decisions on Whitehall development and design matters, it is incumbent on the City to evolve its perspective regarding Lady’s Island, its residents and its resources to one of caring stewardship rather than continuing to treat it as little more than a civic ATM. Who are the members of the Metropolitan Planning Commission? Can I speak at the Feb. 19 hearing? Absolutely. Meetings of the MPC and Beaufort Design Review Board are all public meetings. Provision for public comment is generally made by both bodies. The Sea Island Coalition intends to be there to offer its perspective on the latest plan. More information will be forthcoming. The Coalition is awaiting a copy of the updated traffic analysis, and the staff report from the City of Beaufort is expected this week. We will publish detail on both of these items as soon as received.